Sunshine has finally arrived in Scotland, just in time for the ‘summer’, which is handy. In light of this exciting development, we thought it apt to take a look at the latest trends that are sweeping the UK’s gardens and outdoor spaces in 2018. We just never know how long the elusive sun and warm(-ish) temperature will hang around, so best to hop to it and enjoy the great outdoors in style while you can! We are a hardy nation and never let a little bit of rain, sleet, hail, snow, and biting wind stand in our way of bracing the glory of summer. This is evidenced by the increased sale of garden furniture, accessories, and barbecues. In particular, outdoor kitchens and functional pergolas with integrated drainage and power are growing in popularity this year, with copper accents, wood-effect porcelain tiles, textured paving, and limestone all adding to the outdoor style of 2018. 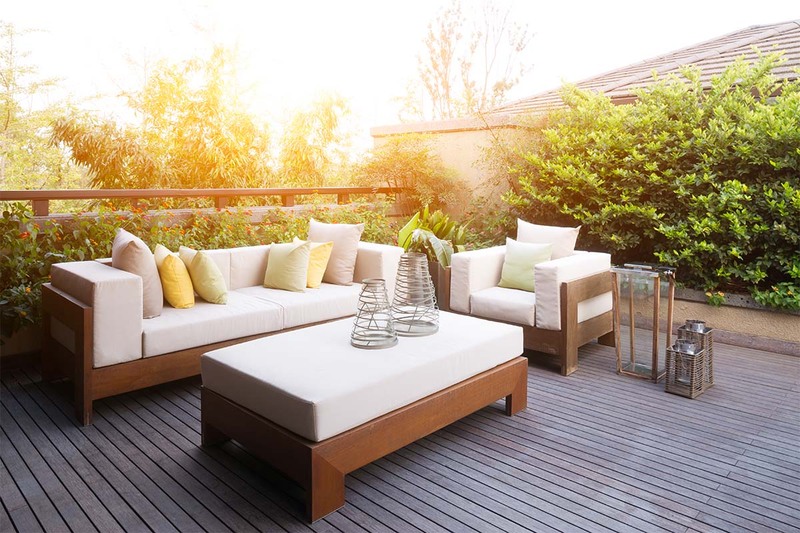 If, like us, you’re determined to adopt the Mediterranean lifestyle and enjoy some al fresco dining, you can create the ultimate outdoor living space with a sunken fire pit or pizza oven, some comfortable outdoor furniture (with plenty of cushions and blankets! ), lots of string lights and glass lanterns. Surround the area with in-ground and potted plants for that lush summer feeling. Eco-gardening is one to the most significant outdoor trends of 2018. This is due to the rise of eco-conscious gardeners—those who are taking a more sustainable and environmentally friendly approach to gardening, with greater awareness and consideration of wildlife. This trend is seeing us move away from the use of chemicals toward a more gentle and holistic way to garden. Going organic, growing your own, and creating the perfect habitat for wildlife are all key elements of eco-gardening, which goes hand-in-hand with our ever-increasing understanding of society’s impact on the environment. The Grow Your Own movement is seeing a resurgence this year. It’s all about being more mindful, considerate, and self-sufficient when it comes to food choices. As food prices rise, more households and choosing to grow their own vegetables, fruits and herbs whenever and wherever possible. A greenhouse is a great way to increase the amount of fresh fruit and vegetables you yield all year round. However, if space is limited, you can grow tomatoes, herbs, and salad leaves on patios, balconies and window sills. Legumes are also ideal because they grow vertically. It can be great fun to grow your own food, and it’s something that all of the family can really get involved with. Houseplants have come back into fashion in a big way in recent years, and this trend continues throughout 2018. We’re spotting quite a few cheese plants (Monstera) in many flower shops, as well as Macrame and ceramic hanging planters, so the 70s houseplant trend is definitely making a comeback! Aside from looking fabulous around the house and outdoor living spaces, surrounding yourself with plants provides excellent health benefits. Within the home, in particular, plants reduce stress, purify the air, lower sound pollution, control humidity, promote better sleep and support improved breathing. That’s certainly a trend we can all benefit from, even beyond 2018!